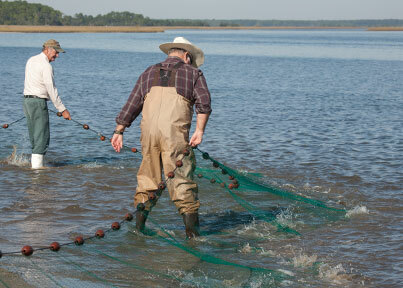 As fishermen, we typically focus pretty tightly on the task at hand–catching fish. However, the fish we catch and take home (or photograph and release) are sometimes different from the species that we eat at local restaurants. If you’re in Panacea, St. Marks–or any other place in Wakulla County, you’ll likely be fishing in some of the most unspoiled waters in the Gulf. Spotted sea trout, redfish, grouper, snapper and flounder inhabit the inshore and offshore waters there. But if you’re hungry for dinner, you’ll likely end up at Posey’s in Panacea or at Spring Creek Restaurant in Spring Creek, eating shrimp, mullet and oysters, species that you don’t usually catch on a hook-and-line. Mullet are considered ‘bait’ by lots of folks on Florida’s east coast, but on the Big Bend, they’re likely more-favored to eat than grouper or trout. At Posey’s (on Highway 98 or near the new city dock) you can have fried mullet, smoked mullet, mullet dip, fried mullet backbones and even get a serving of fried mullet roe (mullet caviar!). And the beauty of eating mullet here (and at all the restaurants in Wakulla County, is that these fish are likely caught in legal seine nets they day you eat them. Oysters are often called ‘the canary in the coal mine’ for Gulf fisheries. In other words, if oyster beds are contaminated by pollution (runoff, oil, etc. ), you’d best avoid eating these usually-tasty bivalves. In Wakulla County, not only are the oysters safe to eat (fried, on-the-half-shell, steamed, or in stew), but they’re downright delicious. And like most of the local fish served at restaurants, they’re fresh from the boats of local fishermen! There's an excellent chance that the oysters you eat at any Wakulla County, FL restaurant will be fresh from local waters.